What are cataracts and what are the symptoms? 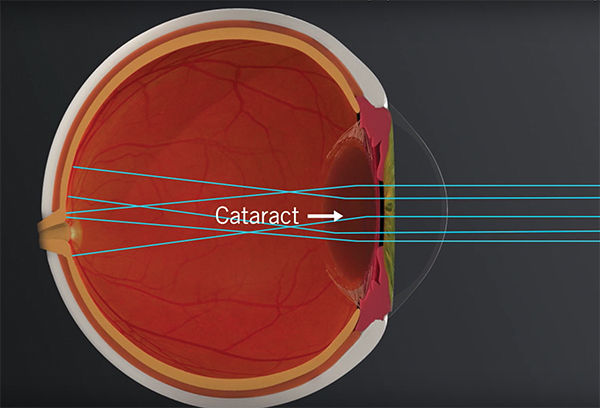 If your vision is getting cloudy, if you are losing your colour perception, if you are having trouble reading or with your night vision, you may be experiencing the early stages of cataracts. When we’re younger, the natural lens inside the eye is normally transparent. As we age, our clear lenses inevitably become cloudy. This is what’s known as a cataract. Cataracts are a normal part of aging. There is no medical treatment to reverse or prevent them. Once they form, the only way to see clearly again is to have them removed and replaced with an artificial lens, known as an intraocular lens. In general, when you are bothered by your vision during your daily activities, it is time to think about cataract surgery. Cataracts will typically not damage the eye while growing, so there is no need to rush into surgery. You can decide when the time is right for you. Although it is surgery, the risks with modern cataract surgery are very low. You should not be anxious or afraid of the procedure. Laser cataract surgery has taken this surgery a step ahead, improving both the surgical precision and outcomes. In addition, exciting advances in intraocular lenses now provide a variety of options as to how you choose to see after surgery. 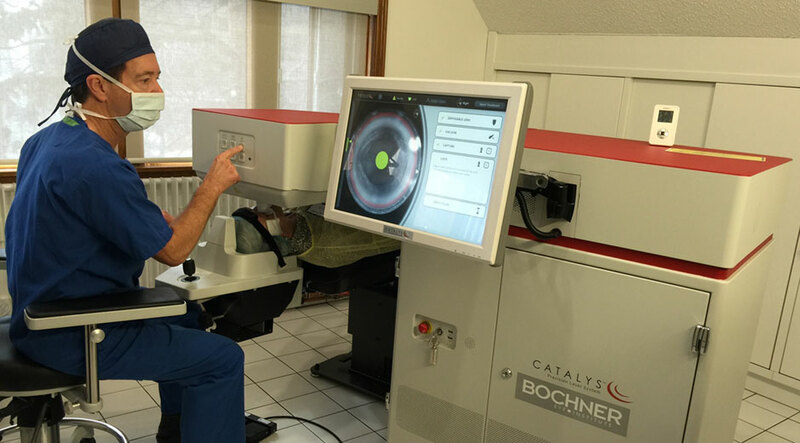 In February 2012, the Bochner Eye Institute became the first eye care centre in Canada to offer laser cataract surgery with the Catalyst precision laser system, considered to be the most significant advancement in cataract surgery in more than 50 years. Steps that used to be performed with hand-held instruments are now completed using a sophisticated femtosecond laser. This includes making the corneal incision and fragmentation of the clouded lens or cataract. The laser procedure is guided by an imaging system with higher resolution than an MRI, customizing the entire procedure to the unique optical characteristics of each patient. In fact, surgeons the world over believe that laser cataract surgery will eventually replace traditional blade surgery completely. What are the advantages of laser vs. traditional cataract surgery? Because of the increased precision, laser cataract surgeries offer better self-sealing incisions, more accurate reduction of astigmatism and the potential for better quality night vision and clearer vision sooner after the procedure. Click here to download our Laser Cataract Surgery brochure. An aspheric implant can provide better quality of vision by reducing spherical aberration. This can reduce glare and usually provides better night vision. The aspheric implant is combined with an astigmatism reduction or control procedure to decrease the need for distance glasses by small incisions in the peripheral cornea. A toric implant, in addition to reducing spherical aberration and enhancing the quality of vision, can reduce astigmatism, and is the best choice in patients with higher degrees of astigmatism. The astigmatism correction of a toric implant is actually built directly into the implant and then rotated to a specific orientation in the eye. A bifocal implant is a multifocal implant that can provide both distance and near without glasses. There may be some glare and/or halos with this type of implant. These symptoms tend to diminish with time. Q: Why does OHIP only cover the cost of a standard implant? A: OHIP covers all medically necessary implants and procedures. 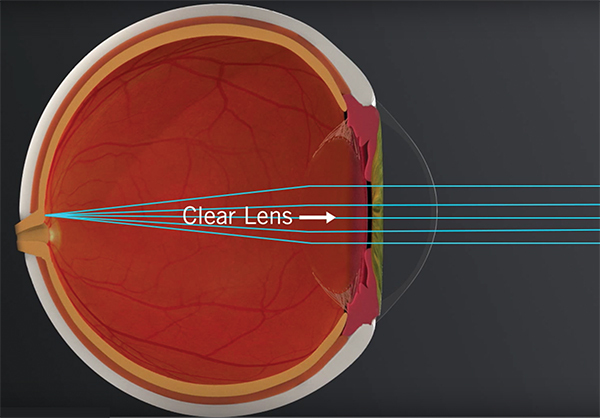 The premium lenses, such as the aspheric implant, toric implant, and bifocal implant are considered elective lenses to decrease the need for glasses. These implants are not considered medically necessary. Q: Are there any advantages to having cataract surgery at the Bochner Eye Institute versus a hospital? A: The Bochner Eye Institute is one of the only independent eye surgical facilities outside of a hospital approved by the Ontario government. The surgeons are privileged to work with highly trained staff and utilize advanced cataract equipment. Patients can have surgery without cost or can elect to pay for advanced features such as premium implants, astigmatism control or reduction procedures, or laser cataract surgery. There is no hospital in the Province that is able to offer the full range of elective choices. Only traditional cataract surgery is performed in hospitals. At the Bochner Eye Institute both traditional cataract surgery and laser cataract surgery are offered. Q: What will I feel, see, and or hear during my operation? A: At the very beginning of the operation you will see a bright light, which is the microscope light. You will then feel a slight burning or irritation, which is the intraocular anesthetic. After approximately 30 to 60 seconds the microscope light will be less intense. You will feel some slight pulling during the operation but no pain. You will hear an automated voice from the ultrasound machine that will sometimes speak words and other times make some noises like a symphony. After 10 to 15 minutes the operation will be over. When you sit up everything will have a red hue and be somewhat dark. This is simply a reaction to the bright light. The vision will gradually improve over 30 minutes. Q: What will my vision be like after surgery? A: When you go home the vision will be slightly blurred. Although the vision is typically better within 24 hours it sometimes takes a few days for any transient corneal swelling to resolve. The vision tends to gradually improve over a few weeks. Q: What medications should I use after my surgery? A: You will be given a prescription for a single medication, a combination of an antibiotic and steroid drop, to be used for 3 weeks. If you are at higher risk of developing macular edema, such as being a diabetic, you will also be given a nonsteroidal drop. Q: When can I drive after my surgery? A: You must get the green light from either your surgeon or your referring eye-care professional. Typically by the next day after you see the surgeon you may be able to drive. However, it may take a while to get used to your new vision. Usually objects are brighter and clearer. You need to exercise caution when driving until you are used to your new vision. Q: What can I do if I am having difficulty reading immediately after surgery? A: If you are having difficulty reading you can purchase a simple pair of reading glasses from the drug store. Although they may not be ideal they will help you out until a proper pair can be prescribed. The eye is usually fully healed at 3 to 4 weeks from the surgery and this is the time that a new prescription can be prescribed. Q: Will I require glasses after surgery? A: Patients that choose a standard implant will typically require glasses for both distance and near vision. Patients that choose an aspheric or toric implant will usually only need glasses for reading. Patients that select a bifocal implant typically do not need glasses unless the print is very small or the lighting is poor. Q: What are the most common complications? A: The most common complication is transient corneal edema. The cornea can respond to the ultrasound (ie phacoemulsification) with some swelling that typically resolves in a few days. Patients may have some irritation or foreign body sensation during the first few weeks from the micro incisions. Artificial tears or lubricating drops are usually helpful.